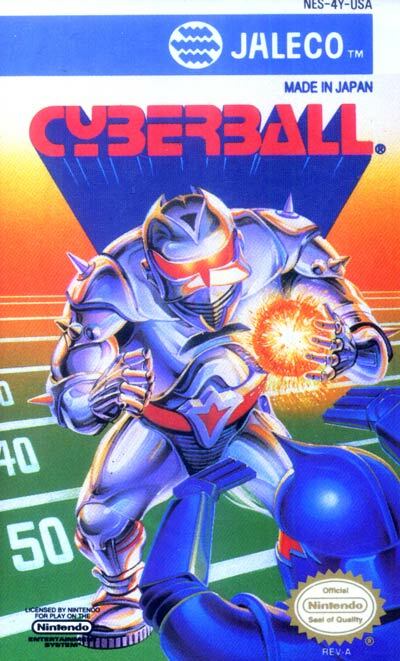 Cyberball is an Atari Games arcade game of 7-man American football, using robotic avatars of different speeds, sizes, and skill sets. The game replaced the standard downs system with an explosive ball that progresses from "cool" to "warm", "hot", and "critical" status as it is used. Players can only defuse the ball, resetting it from its current state back to "cool" by crossing the 50 yard line or by change of possession, whether through touchdown, interception or fumble. A robot holding a critical ball while being tackled is destroyed along with the ball. The robots also possess finite durability. As offensive units are tackled, they wear down, finally issuing smoke and then flames after a number of hits. A flaming robot will explode when hit, thereby fumbling the ball. Players can upgrade robots with faster and more durable units using money bonuses they earn during play. Players select from run, pass or option plays on offense, after which the computer presents four individual plays from which to choose. On defense, a player can select short, medium or long defenses, and then select a specific defensive scheme.